← Vegans Say What? What does “vegan” mean to you? Thanks to the people at work that took the picture for me. This recipe is dedicated to my friend Vilma who is getting married next weekend and has chosen a vegan Red Velvet Cake for her special day. Until speaking with her the last couple months I never thought about this cake nor had I ever had one. Honestly I thought it was a white cake with too much red food coloring. Well I may now say, I have been educated on many levels. After hearing Vilma rave about it and her challenging me to try to make one I started reading up. My first on-line resource is usually The Food Network where I will go read the top recipes (vegan/not) similar to what I am trying to create and figure out my recipe. 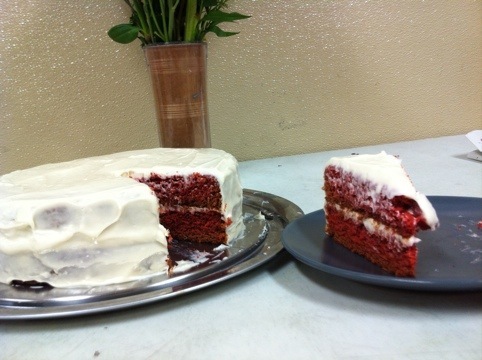 Oddly enough, there was not one five star rated Red Velvet Cake on the site. This is the first time I ran into this and it made me even more curious as to why these amazing chefs couldn’t seem to get it right. This began my quest to learn more about Red Velvet Cakes, find the perfect recipe and veganize it. I started out at Wikipedia where I learned about the history. If you are a food or science nerd like myself you will definitely like to read this. From there I started asking people what a Red Velvet Cake tasted like to them. Funny to me was the fact that 99% of the people I interrogated didn’t realize that there was cocoa in the cake. Others didn’t care for them because they thought it just tasted like food coloring. Food coloring leads me to the final part of my studies. Many people use beet juice to get the color but everything I read on the subject said it would slightly alter the flavor and I wanted to taste an authentic version. Plus Vilma dislikes beets. I then bought a “natural food coloring” which was pretty pricey and I was okay with until one cake turned into three. The natural stuff just became out of the budget though I used a lot less than many recipes call for so it is a slightly darker shade of red then many of the cakes out there. 1. Most red velvet cakes call for cocoa. When making vegan cakes I find that they become more moist and decadent if you use melted chocolate. If you prefer to use cocoa you will need 3 Tablespoons. 2. Make the icing before you do anything else so it can refrigerate for at least an hour. It needs to harden a little to be workable. 3. The picture shows a 2 layer cake but this recipe is for a three layer cake. I ended up doubling the recipe and making three cakes. Make icing with a mixer. You will get smoother icing if you blend cream cheese vegan butter and syrup together first and then slowly add in powder sugar. Refrigerate until ready to use. Mix one cup almond milk and apple cider vinegar. Let sit for at least 15 minutes. When melted chocolate chips add two tablespoons almond milk. It makes it smoother. Preheat oven to 350 degrees. Lightly grease three 9″ round cake pans. My cakes stuck pretty bad because it is a really moist cake. You may want to add parchment paper to the bottom of the pans. In a large bowl mix flour, salt, baking soda & powder, and egg replacer. In a separate bowl mix sugar, oil, applesauce, milk and vinegar mixture, melted chocolate and food coloring. Slowly mix sugar mixture into flour mixture and stir until well blended. Pour batter evenly into the three pans. Tap bottom of pans to get air bubbles to the top. Bake for 20 – 25 minutes. Cake will pull away from side when done. When done let sit for approximately 5 minutes or until cool enough to touch pans with bare hands. Flip onto cooling rack. When ready to ice, cover the first layer with icing. Repeat with next layer. Ice top and sides. If icing gets too soft to work with put in fridge to chill for awhile. Thank you for this recipe and your notes. I have, likewise, never tried a Red Velvet Cake. In fact I only found out about them about 8 months ago! My MIL, husband and daughter all have their birthdays in the next 5 weeks. I think my almost 5 year girl would love to have a red cake. 🙂 If it looks halfway pretty I’ll post a photo on your facebook Wall. can’t wait to give this one a try, yummmm. question on baking powder, directions mention soda & powder, but soda is listed twice in the ingredients, and powder isn’t listed. is it 4 tsp. of powder? thanks! !